Scottish photographer Thomas Annan's view of poor living conditions in the narrow lanes just off the High Street, Glasgow. 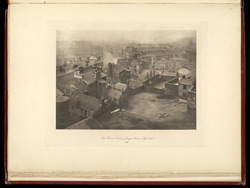 This photograph shows buildings "...given over to the housing of the 'industrious poor', or to those who made their livings in the streets, in one way or another." Extract from Anita Ventura Mozley's introduction to the Dover Edition of 'Old Closes And Streets Of Glasgow'.